Rinse quinoa well and soak for 1hour. After 1hour drain and bring the water to boil in a medium pot over high heat. Add quinoa, lower heat and simmer, cover and cook. As soon as water is absorbed, turn off heat but leave covered. The steam will continue to cook the quinoa, resulting in fluffy quinoa grains. Heat oil in the pan; Add chopped onions, peppers and saute for 3-4minutes. Then add cooked quinoa, salt mix well until heated through. Turn off the flame and allow it to cool down before making balls. pre-heat the oven at 180deg, line and grease the baking tray/oven proof dish and set aside. Repeat the same with rest of the balls. Remove from oven, allow to cool slightly and enjoy with mint sauce/ketchup. 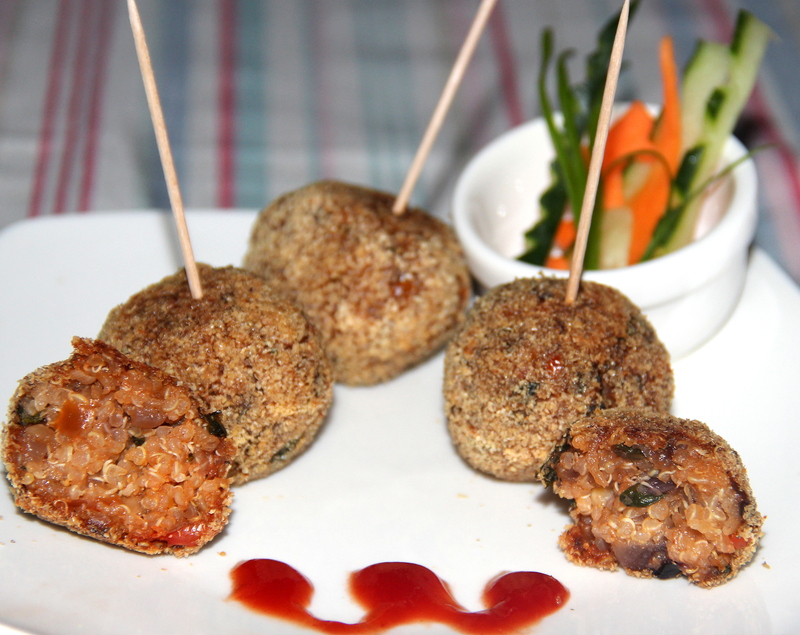 Posted on September 1, 2014, in Appetizers, Indian, International, Starters and tagged Chitras healthy kitchen, drchdietfood, Quiona healthy balls, Quiona recipes, Quiona savoury recipe. Bookmark the permalink. 42 Comments. Whoops, hit return too quickly. I was going to ask about their sticking together. Is it the cornstarch which binds them, or is it kind of like rice that naturally can adhere together. Steven – The moisture in cooked quinoa sticks together…Cornstarch is used just towards coating…. Yummy Chitra, I wouldn’t miss the meat at all! Saving this to try Chitra! Quinoa….I oh so love it!! As always interesting your recipes, and healthy! also important. Delicious and nutritious! How wonderful. Stopping by from the Virtual Vegan Linky Potluck. I love quinoa, but never thought to make them into “meatballs”. Great idea! Another winning recipe with superfoods. My pleasure. I just found out where to buy quinoa locally… gives me the chance to try these.